Immediately after the onset of spring, stink bugs started the process of waking up and moving around following a harsh winter. In some instances, these nuisance insects came into season outdoors; however, we all know that this is rarely the case. Like other bugs, these often move indoors when the cold starts to set in outdoors. It really is not their preference, but, it is necessary for survival. This means, as they start to wake and move about, they are often situated in your attic, your basement, or even behind the walls in your home. The spring and summer months bring a vast amount of sunshine and warmth. During the months of March, April, May, June, July, August, and September, it is not at all unusual to observe these nasty little insects moving in and/or around homes. If you have seen these pesky little creatures in your home or on your property, read on to learn more. There are over 4,700 different species of stink bugs throughout the world. In the United States, there are approximately 250 species. The most common species in and around Indiana have a brown marble type pattern located on its back. There are stripes on the antennae, the abdomen, and the relatively smooth shoulders. The body is five-sided and resembles a shield. The insect has the ability to grow to nearly an inch in length. While it looks absolutely vicious, it poses no threat to humans. It is a nuisance to humans, though, when it invades the home because it will often nest in boxes, clothing, paper, and other items that are commonly stored in attics and basements. If the bug becomes frightened, is disturbed in any way, or is squashed, it will emit a very nasty-smelling substance. The release of this substance is what gave the stink bugs their name. The stink bug is a major summer nuisance to those that live in Indiana. This is mainly because the bugs eat many different types of plants. These include vegetables, fruits, legumes, and ornamental plants. The stink bug also enjoys munching on the leaves of trees and weeds. 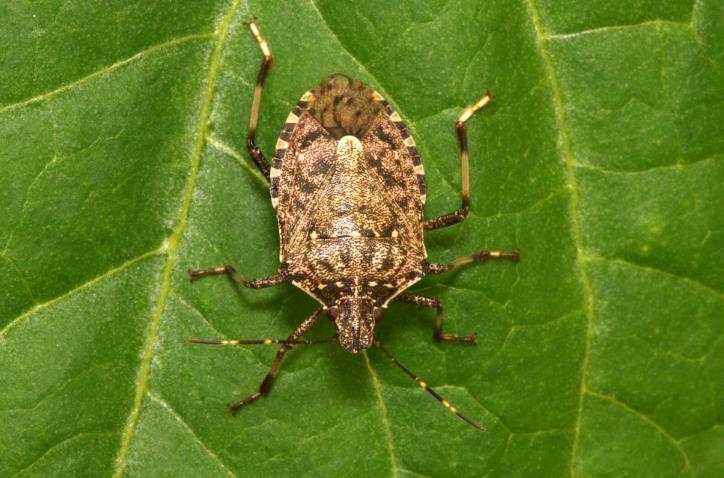 For those that care about the appearance of the lawn, grow plants, and cultivate gardens, stink bugs will be a serious burden during the summer. This is especially true given the fact that these pesky insects are impervious to the various types of insecticides that are currently available on the market. Stink bugs – though not an immediate danger to people – are a danger to plants and various types of vegetation. It does not matter if you have one tree on your property, a greenhouse, or an entire crop growing, you stand the chance of suffering from the detrimental effects of the stink bug. If you are ready to rid your home and/or your lawn of these summer nuisances, simply call All Pest Exterminating today! We have a vast array of tools and resources at our disposal to quickly and safely eliminate populations. Call us today.